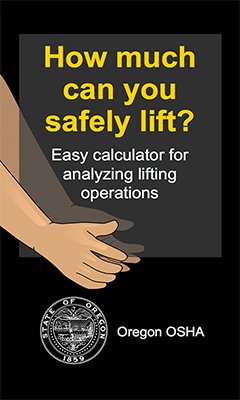 Oregon OSHA’s easy lift app was developed from a review of research on safe lifting to give the user a maximum safe weight for various lifting scenarios. Indicate where your lift begins. Estimate the number of lifts per minute and the hours of lifting per day. The app calculates the maximum safe lifting weight, with an additional limit for more than 45 degrees of twisting during lifting.